1-19 –Izintombi Zesi Manje Manje Awufuni Ukulandela Na? 2-10 –The Soul Prophets Soul "Imbaq"
Box set comprising Various - Next Stop... Soweto (Township Sounds From The Golden Age Of Mbaqanga), Various - Next Stop... Soweto Vol. 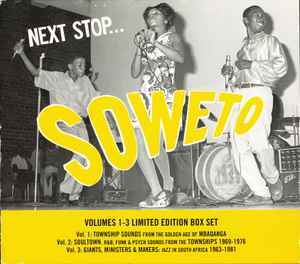 2 (Soul, Funk & Organ Grooves From The Townships 1969-1976) and Various - Next Stop... Soweto Vol. 3 (Giants, Ministers And Makers: Jazz In South Africa 1963-1978). Individual releases, packaged in separate jewel cases. All sets enclosed in an outer card sleeve. Tracks 2-4 & 2-15 credited to Philip Malela on outer card sleeve and Phillip Malela on CD sleeve. Track 4-4 credited to Heshoo Beshoo Group on outer card sleeve and The Heshoo Beshoo Group on CD sleeve.